!! WEIGHT LIMIT OF 75KG !!! 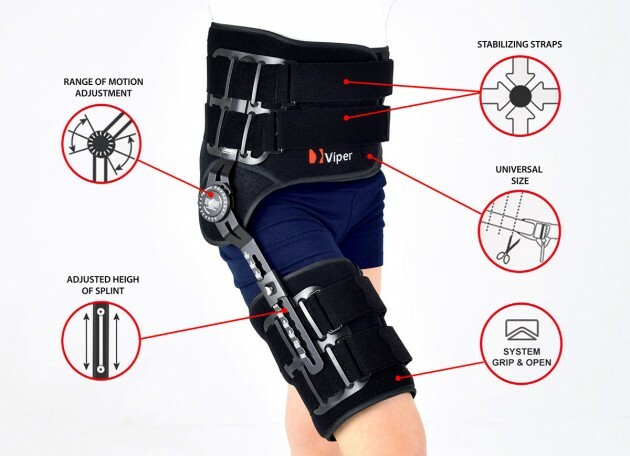 Immobilizes or controls the pelvis joint, equipped with pelvis frame, thigh band and lateral splint 1RE with adjustment of the flection and extension angle every 15 degrees. The brace assures correct positioning of the pelvis during upright standing and learning to walk, prevents and helps in treatment of contractions. Use: in early rehabilitation, during learning to walk after surgery treatment of the pelvis joint, in treatment of patients with contractions of pelvis joint due to neurological or orthopedic problems. The brace is made of ActiveDistance. - the support assures correct positioning of the hip during upright standing and learning to walk. It prevents contractures and helps healing them. It enables controlled movement of the hip joint. Instruction of use is given by the leading doctor. Splints 1RE – single axis orthopedic splints, used mainly in knee joint, upper limb and hip joint braces. The characteristic quality of this splint is, apart from wide range of motion adjustment in every 15 degrees, is also hyperextension adjustment in the secured range of -15 and -30 degrees. The splints are characterized by perfect lateral joint stabilization and low weight. The set-up of the angle adjustment clock doesn’t require any tools, and special safety system prevents the change of the angle by unauthorized people. The splints are made of high quality aluminium alloy and plastic with carbon fibre. They are light and neutral to the influence of sweat and salt, properly firm, assuring correct functioning of the device. Standard length of the splints is: 380, 470 and 530 mm. The splint and its design are patented in European Union by Reh4Mat company. The perfect solution for patients who want to fight with hip joint pain is REH4MAT new brace AM-SB-03 with the function of thermotherapy, equipped with original cold hot packs.